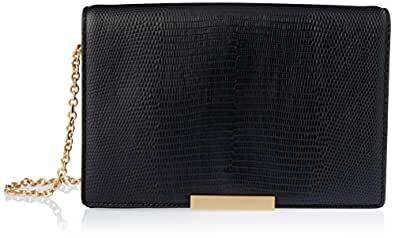 The Oroton Cruise Clutch is elegant and functional, and will take you from desk to bar with ease. The Black Lizard Embossed leather outer with Brass hardware opens via a flap with magnetic snap closure to a leather and Cotton Twill lined interior with a phone pocket, as well as an internal zip pocket on the front. The removable and adjustable chain strap with leather shoulder rest can be worn long as a cross body strap or short as a shoulder strap. The finishing touch is the Oroton branded hardware tab.